For a gourmand aiming at any level of sustainability and ethical choices shopping is one continuous minefield. Which one is more ethical choice: domestic veggies grown in green houses outside their natural season or fresh produce flown in from abroad? How much meat is it ok to include in one's diet? Is imported organically reared chicken more informed choice over a domestic chicken produced in dubious conditions? Is it ever justifiable to buy seafood flown in halfway across the planet even if that's the only way to ever get one's hands on any? There are so many things to take into consideration: taste, price, carbon footprint, ethics... But how is one to choose which one to value above the others when the time comes to make a choice? Root veggies are luckily a relatively hassle-free zone. A turnip doesn't evoke the kind of passions that make the masses take to the barricades and I doubt a humble carrot has ever inspired any kind of a liberation movement. They are locally produced and often a very affordable choice, too. 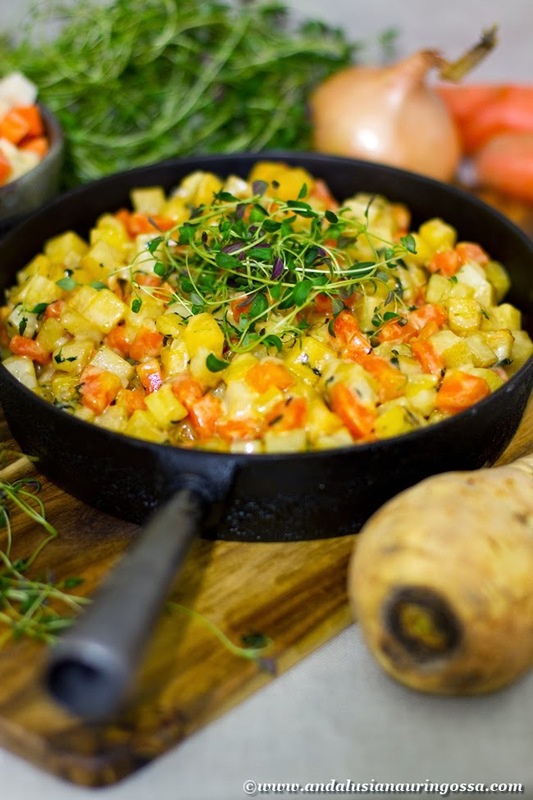 They also possess the kind of gentle sweetness that I've learnt to appreciate lately and so this root veggie hash has been a frequent guest at our dinner table. Peel and dice the root veggies. Peel and roughly chop the onion. Finely chop the garlic cloves. Sauté the onion and garlic in a mixture of butter and oil for a minute and then topss in the root veggies. Season and cook, covered, over medium heat until they're al dente - depending on the size of the cubes 10-15 minutes. Combine mustard with cream and thyme leaves. Pour into the pan. Continue cooking for five minutes or so until veggies are done and the dish is piping hot all the way through. Check the taste and season as needed. This makes a quick and easy side dish for just about any meat. I've particularly love this with these cranberry, rosemary and venison meatballs!